What a long time coming this day is – to be precise, 18 years, 1 month, and 24 days is what it has been since my thirteenth birthday. But today is not about a simple Bar Mitzvah. It's not about marking the day where I finally become a man; though I am happy that I finally made it! Today is a celebration of G-d; of destiny; of things that are simple beshert – or meant to be. It's a celebration of dreams being actualized; of fulfilling promises made; and it is the celebration and guidance of two souls who are undoubtedly dancing in heaven today – my Grandpa, Lester and my mother, Michele. Today marks a landmark day on what has been nothing short of an incredible journey - at least, that's what everyone in my life these days seem to tell me. I invite you all to join me for the next few minutes as I seek to give you all a Reader's Digest version of inspiration in how you can find G-d, find meaning in your life, and reach an understanding that everything does indeed happen for a very specific reason. I was born on March 13, 1984. My mother died on November 14, 1986. It doesn't take a mathematician to figure out that that's just a day over only 2 years and 8 months with your mother... even as I say that aloud, it still doesn't quite sink in. I have one fuzzy memory of my mother which involves me playing a card game with her when she was in the hospital right here at Winthrop University Hospital -believe you me, I hold this memory ever so tightly. But as I said, today is about a celebration of souls. My mother's soul has been so much purpose, so much meaning. In all honesty, the first time that Rabbi Anshel Perl had ever come to the village of Mineola was to visit my mother in the hospital. Thusly, this Cong Beth Sholom Chabad Mineola, and perhaps many of the Chabad's throughout Long Island, would not have existed as we know them today if not for Rabbi Perl being so giving of his time to see my mother. As I said – her soul has so much purpose. I know it's hard to believe, but before my mother passed away, she had but one wish for an energetic young Rabbi who the only Rabbi was willing to see her in this hospital even though she was not a member of his congregation. That wish? "No matter what happens to me, please promise me that Matthew will one day become a Bar Mitzvah." Flash forward 11 years, sprinkle in a little Hebrew School on the evenings and weekends and voila; you'll have a Bar Mitzvah boy! I can tell you, the journey has been nothing of the sort… quite possible, this story has taken the most circuitous route one could imagine. Still a toddler, my father tried his best to keep me safe, happy and cared for after my mother passed away. In general, he did a very good job. Amongst different decisions that were made, my father who wasn't Jewish but had been practicing Judaism because of my mother, decided to get re-married to a woman who also wasn't Jewish. Through one event upon another, the Hebrew School that I had begun attending was no longer seen as the most suitable place for me to have a religious education. At about seven years old, I was presented with a question. This isn't a direct quote, but I'm paraphrasing, "If you ever feel left out of the family for any reason because of your religion, we can always arrange for you to have a baptism…"
Certainly, I only think that the right intentions were felt in offering this suggestion; but in all honesty, what did I know? In truth, the thought of being left out of the family was not a concept that had ever crossed my mind until now. All I really understood at this point was that there was Christmas, and there was Hanukkah, and I would continue to be the beneficiary of both no matter what. With all that being said, some months later, I told my family that I had wanted to have a baptism and become catholic. And sure enough, in April of 1992, I was baptized in a catholic church and began a religious education in Catholicism. Just let that sink in for a moment – a Jewish, eight year old boy essentially defecting on his religion; as unconscious a decision that this may have been, I thought I would be happier this way. And for a time, I was. So on we went – I continued going to Catholic School one day a week for catholic studies, though I still kept up with the Jewish Holidays because of my amazing Aunt, Grandmother and Grandfather. As I matured, I grew fond of both religions and associated myself as "both Jewish and Catholic." Everything seemed fine. Truthfully, I can probably tell people things about two religions better than some people can tell about one! But then when I was thirteen, I received the worst news I had received in 11 years. I had lost my grandfather, Les Goldman, without any warning. 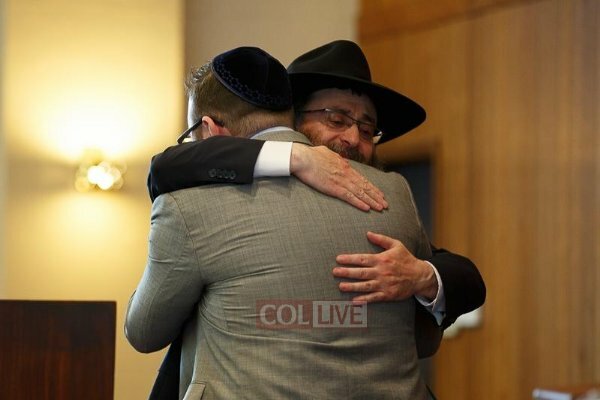 At the funeral, I ran into someone that I had only heard about in stories, but never fully remembered on my own – a wonderful Rabbi by the name of Rabbi Perl. Rabbi Perl looked at me and with his warm smile and said, in his unmistakable English accent, "You know, we still have to talk about the Bar Mitzvah for you, dear boy." As Rabbi Perl only told me recently, he did indeed strive to make this occur but unfortunately, the idea was not met with enthusiasm. But then something bigger intervened-something that I'll never be able to fully explain. I was 14 and sitting in church for my Catholic Confirmation day – the day where I will have essentially graduated from my catholic studies. The priest was moving through the service and reached a portion where he mentioned individuals who had passed away recently. Most times in church, these were names that I never recognized. However, today, something incredible happened. As I sat there in my red confirmation gown, the priest bellowed: And to those that have died and can't be with us for this great day, including Michele Goldman…"
Her name echoed throughout my head and resonated in my hear…I naturally looked at my father – he shook his head as if to say that it wasn't him who asked for her name to be uttered…My jaw nearly hit the floor. Right then and there I realized…this just isn't right—I'm not meant to be here. I'm not meant to be doing this. This is not my path. Though I went through with the rest of the day, I knew right then and there that this life, this religion, was not my identity. I knew then and there that one day, I was going to make my Bar Mitzvah, no matter what. And on we go – 16 years old and I meet the love of my life to the girl who would one day become my wife-my beautiful Lori. Naturally, I told Lori my story. Intently, she listened to every word, asked question after question, and made me feel so validated and empowered in my Jewish heritage. I remember her telling me words that my grandmother had told me before, but I wasn't ready to hear them until now, "Remember that if your mother is Jewish, then you are Jewish too." I am 24 now, my wedding day. My wife and I are married under the glorious late afternoon in August. A traditional Jewish wedding with all the trimmings – beautiful ketubah, a gorgeous chupah, break glass, a nine-piece band who sang in Hebrew and English, a monster hora dance – the works. Lori and I have a beautiful Jewish home with a gorgeous daughter, Madeline. I even have Israeli in-laws-yes, I went for the real thing, people! I have a conversation with my aunt who expresses something amazing to me. "leah (who's my amazing cousin) and I are heading to a Bat Mitzvah this weekend and you will never guess who the Rabbi is." I guessed right. Rabbi Perl. She comes to the Bar Mitzvah, re-introduces herself to Rabbi Perl, and, in my mind. She brags about me a little bit to him. She provides him with my cell phone number and, not more than two hours after the end of the Bat Mitzvah, I get a beautiful message from an amazing man. We speak, we‘re re-meet,' I catch him up on the last, oh' 29 years or so of my life. It's time for me to fulfill a life-long goal and it's the chance for a most esteemed Rabbi to fulfill his promise. The preparations begins. I am introduced to the rabbi's son, RabbiDovid Perl - the man who taught me my first lessons with the Aleph Beit. You have taught me so much more than just how to read Hebrew, but you've taken it upon yourself to educate me on all things of what it means to be Jewish every opportunity you can. I am so thankful to you for your teachings, for your kindness, for your friendship, and most of all, for your incredible patience as it takes my roughly 10 minutes to get through every prayer that I attempt to read. And to the venerable Rabbi Anshel Perl. "You have given so much to my family – my mother and my grandfather in particular. You've never wavered on your promise to my mother that this day would come to fruition – and lo and behold, here it is. Thank you for never giving up on me- never giving up on her. And, even though I couldn't say it 29 years ago, thank you for guiding my mother spiritually and emotionally when she needed it most. My grandparents always told me how wonderful and kind you were, but now knowing you in person, I can honestly see how right they were. And, my friends, here we are – 29 years later; a promise fulfilled on Lag B'omer 5775 - May 7th, 2015. Today marks what feels like the pinnacle of a mountaintop, the end of the longest journey, finding the 'x' on a treasure map – However, a wise Rabbi told me recently that today is not the end of a journey; but instead, it should be thought of as a rung of a ladder toward a continued life and journey with Judaism—the religion that I hold so dear and am so proud to be associated with. Today, I climb up to this rung and I share this day with you all, my incredible grandfather and my beautiful mother. Guys, I did it! thank you for leading me here. Thank you and May G-d bless you all.